This oriental doll is marked 164 on the back of the head which represents the maker Simon and Halbig. Apart from a firing line along part of one seam and a teeny one on the other side, the head is perfect. These lines are not damage but just happen in the firing process. 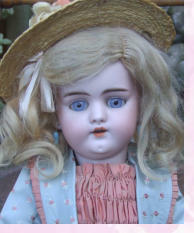 Her eyes open and close and have all their eye-wax, and her pate and mohair wig are original. Her body is in very good condition although there is a little surface cracking to one hand and foot. She still has some blush on her knees. Her kimono is hand made from old materials – unfortunately l had no shoes suitable for her. She measures 23 inches and dates around 1910.